The Lesser Kestrel (Falco naumanni) is a small falcon. This species breeds from the Mediterranean across southern central Asia to China and Mongolia. It is a summer migrant, wintering in Africa and Pakistan and sometimes even to India and Iraq. It is rare north of its breeding range, and declining in its European range. The scientific name of this bird commemorates the German naturalist Johann Andreas Naumann. It is a small bird of prey, 27–33 cm in length with a 63–72 cm wingspan. It looks very much like the larger Common Kestrel but has proportionally shorter wings and tail. It shares a brown back and barred grey underparts with the larger species. The male has a grey head and tail like male Common Kestrels, but lacks the dark spotting on the back, the black malar stripe, and has grey patches in the wings. The female and young birds are slightly paler than their relative, but are so similar that call and structure are better guides than plumage. The call is a diagnostic harsh chay-chay-chay, unlike the Common Kestrel's kee-kee-kee. Both sexes do not have dark talons as usual in falcons; those of this species are a peculiar whitish-horn color. This, however, is only conspicuous when seen birds at very close range, e.g. in captivity. Despite its outward similarity, this species appears not to be closely related to the Common Kestrel. In fact, mtDNA cytochrome b sequence analysis (Groombridge et al. 2002) places it at a basal position with regards to the other "true" kestrels (i.e., excluding the American Kestrel and probably the grey African kestrels too). Its divergence is tentatively placed to around the Miocene-Pliocene boundary (Messinian to Zanclean, or about 7-3.5 mya). The morphological similarity with the Common Kestrel is most puzzling, but still it appears to betray the present species' actual relationships: the lack of a malar stripe seems ancestral for kestrels, and the grey wing colour unites the Lesser Kestrel with most other Falco species, but not the other true kestrels. The Lesser Kestrel is, as the name implies, a smaller and more delicate bird than the Common Kestrel, and it is entirely sympatric in its breeding range with it; they compete to a limited extent. Thus, the possibility that there is some form of adaptive advantage to the similar coloration deserves study. Considering that the Lesser Kestrel would in fact have an advantage if some would-be predators confuse it with the larger species and consequently avoid it, it might be a case of Müllerian mimicry. The Lesser Kestrel eats insects, but also small birds, reptiles and rodents (especially mice), which are often taken on the ground. It nests colonially on buildings, cliffs, or in tree holes, laying up to 3-6 eggs. No nest structure is built, which is typical for falcons. Recent surveys (January 2007) by LPO have revealed that in their wintering grounds, Lesser Kestrels roost communally - sometimes in huge numbers. 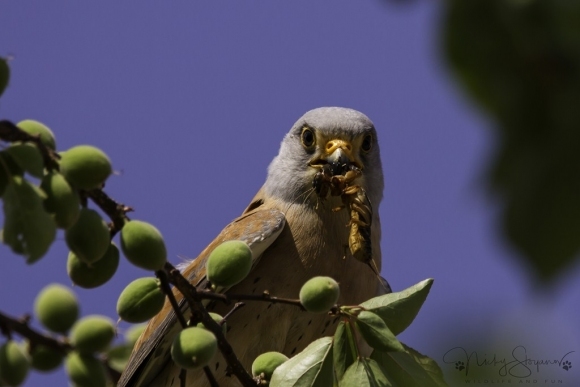 A roost discovered in Senegal during one of these surveys held 28,600 birds, together with 16,000 Scissor-tailed Kites Chelictinia riocourii. It is widespread and plentiful on a global scale, and the IUCN have classed it as Least Concern. Apart from possible habitat destruction, it appears that indiscriminate use of pesticides has a strong effect on this species due to its insectivorous habits.